A friend from my hometown of Putnam, Connecticut posed a question on Facebook about what the word “Aspinock” literally means. Putnam was incorporated in 1855; in earlier years it had been known as Aspinock, but it was later named Putnam after General Israel Putnam of the Revolutionary War. Our local historical society remains the Aspinock Historical Society after this “original” town name. 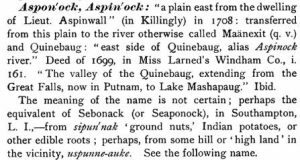 Several of us have tried to determine what Aspinock literally means in the native tongue of Algonquin, but answers are somewhat unclear. Putnam was created from part of the towns of Killingly, Pomfret, and Thompson. Killingly was formed in 1708 and the name Aspinock dates back to at least a decade prior, as the English families that settled there were referring to it in deeds by that date. This definition had been suggested on the Facebook post, citing James Hammond Trumbull’s Indian Names Places, etc., in and on the Borders of Connecticut with Interpretations of some of them (Hartford, 1881), shown above. Adrienne Cuvellier and her husband Guillaume Vigne were natives of Valenciennes, France, and were some of the earliest permanent European settlers of New Amsterdam (now New York City) in the early seventeenth century. However, living primarily with Dutch neighbors, the French name of Adrienne Cuvellier was “Dutchified” to “Ariaentje Cuvilje.” You will find this also with many Pilgrim names in Leiden, Holland. Numerous examples of this exist in Quebec. One example was summarized in a Register article by Michael Leclerc on his ancestor Joseph Philippe Ouabard dit Langlois of Cap St. Ignace, Quebec (ca. 1690–1756). The “dit” name “Langlois” or “L’anglois,” meaning in French “the Englishman,” is often the sign of a possible New England Yankee or other English immigrant in Quebec. In this case the surname “Ouabard” was a “Frenchified” version of the English surname Webber. It’s certainly useful to think of names as they may have pronounced by the local population, and how that may have affected spelling or been changed by exposure to other languages. Thanks to Eric Gould, Cheryl Stedtler, and Cheryll Toney Holley for the engaging discussion on the possible origins of this name. All three are of Nipmuc descent and are my distant cousins though the Gay family of Dedham; they were also the subject of an earlier blogpost. Peter Aspinwall’s brother Nathaniel, another early settler in Killingly, is my great-great-great-great-great-great-great-great-grandfather. This couple provides a second way Presidents Theodore and Franklin Roosevelt were cousins, beside their shared descent from the Roosevelt immigrant. Herbert F. Seversmith, “Ariaentje Cuvilje (Adrienne Cuvellier), Matriarch of New Amsterdam,” National Genealogical Society Quarterly 35 : 65–69; Gary Boyd Roberts, Ancestors of American Presidents (Boston: NEHGS, 2009), 539, for the Roosevelt kinship through Vigne. Michael J. Leclerc, “From Webber to Ouabard: The Probable New England Origins of Joseph Philippe Ouabard dit Langlois of Cap St. Ignace, Quebec,” Register 195 : 308–15. Perhaps another example from Quebec is Matthias Farnsworth, captured in Groton in 1704, who became Claude Matthias Fanef in Quebec. The surname of his descendants became Phaneuf. Further south on the same Quinebaug River, in the town of Griswold, is Aspinook Pond, a section of the river behind a dam erected by the Aspinook Mill in the 19th century – a slight variation of the spelling used in Putnam. I am familiar with the name since my father was employed as a bookkeeper at that mill in the 1940s. 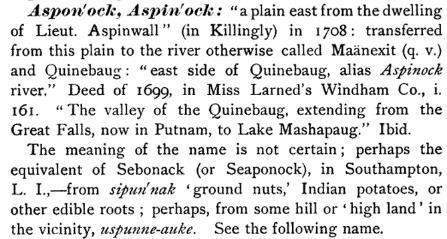 There is another take on that 1699 deed on Google that says “Aspinook” was the original Native American name, according to their brief speculation. (History of Norwich, Connecticut: From Its Possession by the Indians to the Year 1866 Frances Manwaring Caulkins). I downloaded the book to get ideas about the meaning of Native American words and their anglicization. It could be a vast study. I grew up on Chautauqua Lake, in New York, and have heard “definitive” answers about its meaning that contradict each other. Your post was very enlightening. Northern New England and most of New York had been settled by the French, and although they were pushed back in the French and Indian Wars, it stands to reason that “French” place name spellings (Francosized? Frenchified? Native American) still existed a few decades later in an area that was bought by the Holland Land Co. and resettled largely by veterans from War of 1812, a war that covered the same territory and forts in western New York. Chautauqua (styled early as Chautaque) is decidedly French looking. Confusing, and even laughable, things can certainly happen to names when cultures mingle. One of the greatest coups I’ve pulled off was discovering the half-brother-in-law of my Nantucket gg-grandfather who moved to Southern California. His name was Francisco Elizalde, but he had been enumerated under his step-father’s surname of Juarez…spelled “Wharis”! One of my New York ancestors was German in origin, surnamed Bastian, but even in 1729 when he was naturalized as a British citizen, his name shows up in those records Dutchified as Bastiaanse. He married a woman of Dutch descent going back in New Netherland to 1636, in the Dutch Reform Church, so the dominee retained the Dutch form for the groom. Several generations later, my branch of the family moved from Schenectady to southern Indiana, and changed the family name to Bastion. Two generations later, a daughter in that family married a Waggoner, taking the ethnicity of the name full circle.